We set off early this morning so that we'd arrive when the park opened and get in a full day of fun. Sadie could hardly wait on the car ride there. Finally, after an agonizing ten minute drive (agonizing to the three year old who was asking if it was morning before 8pm the previous night), we arrived and took the tram to the ticket booths and then the monorail into the park. I had read up on toddler/baby Disney World strategy last night after everyone was in bed and when we arrived at the park I had a plan. We went straight back to fantasy land to ride as many rides as we could before the crowds arrived. We breezed through the carousel, Dumbo ride, Winnie the Pooh ride and Tea Cups pretty quickly and then headed over to the other side of Fantasy Land to go on the Small World ride, the Peter Pan ride and to see the Mickey Mouse 3D Phil-somthing movie. I was a little nervous about taking Mae in to the movie, but it was really good (3D technology seems to be a lot better than I remember it!) and both girls sat quietly through the whole thing). And all of that was before lunch! After lunch we headed over to Frontier Land. Can you read the name of the ride that we're coming out of? It's Big Thunder Mountain Railroad. Sadie is over 40 inches tall, which means, at the ripe old age of three (she isn't even 3 1/2 yet! 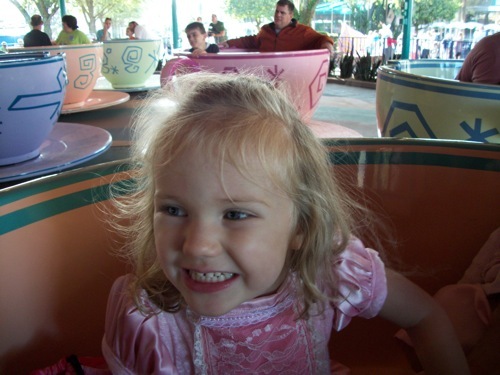 ), she's tall enough to ride most of the faster rides at the park. 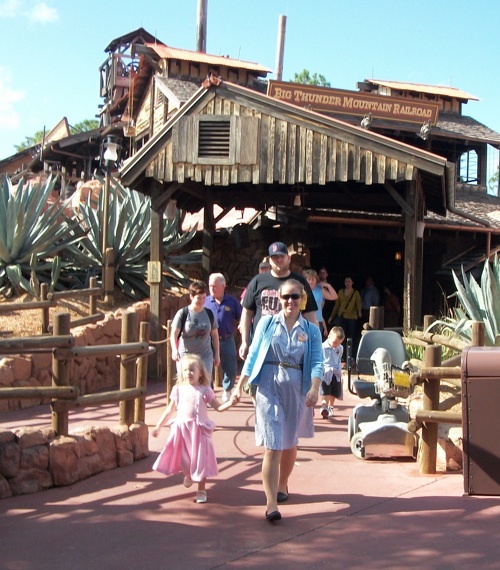 I thought we'd try out Big Thunder Railroad to see how she liked it before trying anything else. As the car climbed in complete darkness I began to wonder if this wasn't a little too scary for Sadie. And then she started to giggle. And she began to yell: "Ready, Set, Go!" and "Faster, faster!" As soon as we got off the ride she was begging to go again, which was perfect because the park has a ride-swap program. This meant that when we got to a ride Mae couldn't go on, we'd go up and ask the fast pass person for a swap pass. Sadie and one of us would stand in the regular line (the longest ones we saw today were like 10-15 minutes), while the other one walked around with Mae outside. Then when the pair on the ride finished, they'd come off and Paul and I would swap places and Sadie and whoever hadn't gone on the ride would go back and use the fast pass to bypass the line and go on the ride a second time. It was a pretty sweet deal for Sadie. Big Thunder Railroad was a success, so we tried Splash Mountain. Sadie thought that Briar Fox and Briar Bear were very scary. But she giggled and cheered the 50 foot waterfall drop (twice!) and begged to go again each time. She's pretty fearless when it comes to rides it seems. We headed to Adventure Land after Frontier Land and went on the Pirates of the Caribbean ride, where Mae Bae fell asleep, mid ride. Three minutes later she woke up when we left the ride (and refused to nap for the rest of the day. She was determined not to miss anything). We were on the Jungle Cruise when it began to pour rain, but it was back to blue sky by the time we'd reached the end of the river and emerged from the covered boat. Then Sadie met her first Disney Character. Unfortunately with her new hat she thought that the best thing to do was to charge Mary Poppins, with her little head down like a bull. Thankfully the hat is soft. 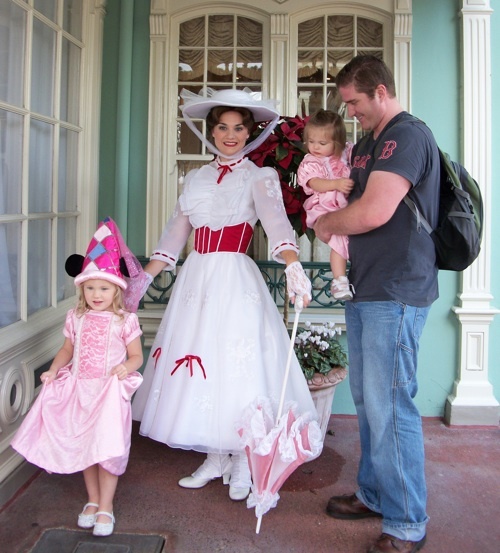 And Mary Poppins was very gracious as we apologized and told Sadie that we do not charge people with our hat, and she said that she didn't think she'd done it on purpose, she was just a little top heavy with her new hat. 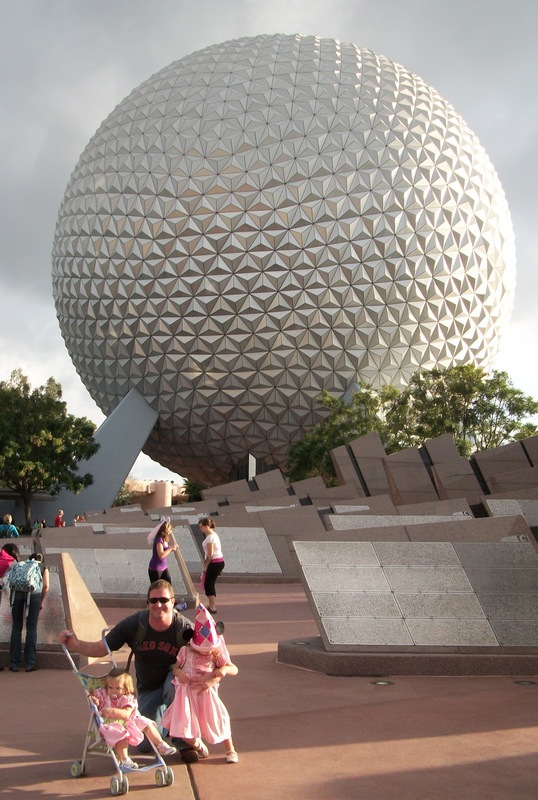 After dinner we headed over to Epcot. Sadie announced that she would like to live in an Earth shaped space ship. Paul smiles through the tantrum without batting an eye. This would be a I'm-done-with-pictures-pinch. Both girls were actually really well behaved 95% of the time today. But we still had our moments! After a walk around Epcot, which included going on the Nemo ride and walking what felt like miles and miles (my feet were pretty tired after hours of walking!) 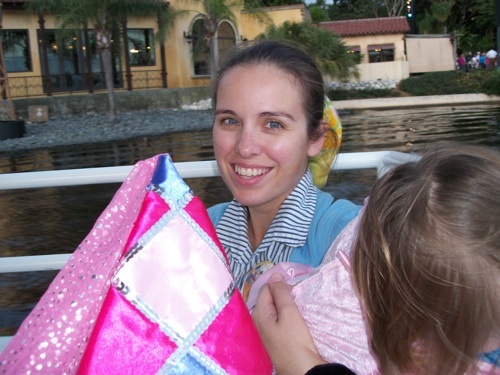 we took the ferry back across the lake, and then the monorail back to the main park. In this picture I'm pretty tired! And Mae Bae is trying to stand up to climb out of the boat! And that, in a nutshell, was our day! I feel like we fit a lot in, since the park wasn't very crowded! This is the first vacation we've taken with out little family in a very long time and we're pretty excited! Looks like you have an adrenaline junkie on your hands my little sister was the same way and now at 13 does MMA (mixed martial arts) for fun and the rush. Looks like the girls had a great time. Sadie must be fearless, Splash Mountain scares me with that big drop. I have to psyche myself up to ride that. Did she get to ride on Space Mountain? My oldest loved that ride when she was 6. I thought she was going to be terrified and instead she asked to ride it several times. I have actually let my oldest daughter ride in one of those double strollers when she was 6, 7, and 8 years old. When we go down there we spend 5-7 days in the parks and we're there from open to close which means we're walking from 8 or 9am until somewhere between 10pm til midnight. Typically we'd only let her ride in it for a brief period after she had spent most of the day walking or in crowded areas. We have also made her sit in the stroller so her little sister could have someone to lean on while she slept. Looks like you had a great day. Glad you guys got to go to Disney without the crowds. Congrats!! 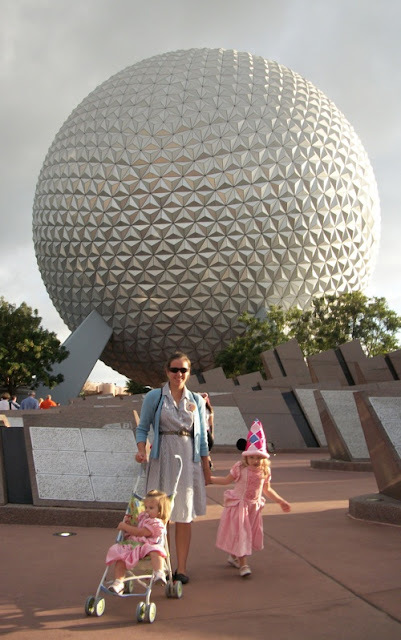 My family took 2 vacations to Disney World. Once when I was 4 and another much later. We went in the dead of summer. But I remember the later one, when it would rain for 15-20min every afternoon, it was a great time to ride the rides, because people would all take cover. I must say that the reason why some parents would have older than normal children riding in strollers (though not 8 year olds) is because crowds can get really bad and lost children are no fun. When I was four I got lost coming out of the bathroom with my sister. Now Disney has a really good lost child program, but that doesn't mean it doesn't happen and isn't really scary for both parent and child. 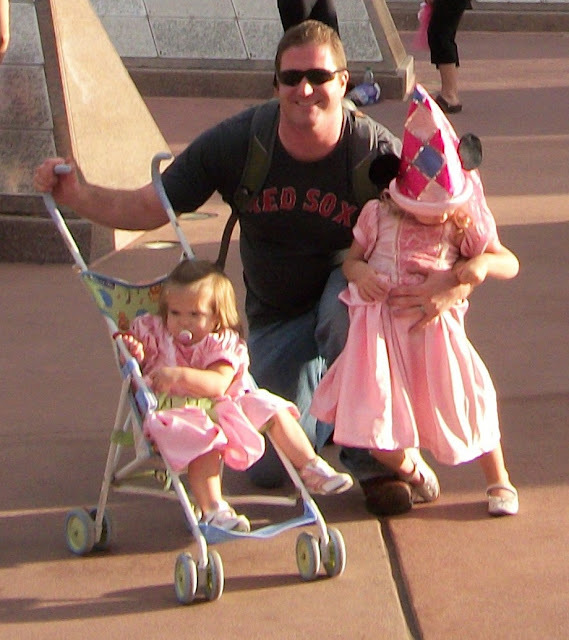 (And no I was not riding in a stroller, because my little twin siblings (2 years) were riding in the double stroller). Glad your day at Disney went well! We may be down for a Disney visit ourselves next Fall. I should clarify on the older kids thing (I don't want to sound too mean about it!)! I definitely wouldn't think anything was weird about a four or five or even a bit older kid riding in a stroller. Or even an older kid riding in a stroller late in the day. But the combo that I found kind of weird was older kids in the morning, when they couldn't have possibly been walking around the park for very long, because the park hadn't been open for all that long... Now I can totally even see getting a stroller to help carry all a persons stuff... and I wondered if that was part of it too!